The Incredibles: Bob/Mr. Incredible, Helen/Elastigirl, Dash and Violet. An ersatz Fantastic Four family that’s finally embraced their destiny as a crime-fighting team– an old job for the parents and a new one for the kids. Lucius Best aka Frozone, a close friend of the Parr family (he was best man at their wedding) and another superhero. Although retired and adjusted relatively well to civilian life, he’s been going on occasional covert vigilante outings with Bob, and is doesn’t hesitate to spring back into action when he sees the Omnidroid wreaking havoc in the city– there’s a very funny segment where he argues with his wife about where she put his old superhero gear. Armed with: Roughly analogous to Marvel’s Iceman, Frozone’s powers are related to ice and cold. He can instantly freeze nearby water or even moisture straight out of the air, and failing that can use the moisture in his own body. The boots on his super suit can transform instantly into a sort of high-tech snowboard. Voiced by Samuel L Jackson, who’s clearly having fun. Omnidroid version 10.0, the biggest & baddest one yet. Armed with: In addition to being the size of a large house, this Omnidroid has SIX weaponized tentacles (the claws of which can detach or be manually launched) and a swiveling laser cannon near its sensor. The Setup: The end-stage of Syndrome’s plan with the perfected Omnidroid is to launch and then re-drop it from orbit into a populated area so that people will assume it’s an alien craft, then eventually have it attack everything in sight– it’s kind of the inverse of the plot of The Iron Giant, come to think of it. Syndrome will then show up and “defeat” his creation, passing himself off as a new superhero. It goes off pretty well at first, but the robot has actually grown sentient enough to rebel against Syndrome, and before knocking him out was able to separate the villain from the wrist-gauntlet he’d been using to control Omnidroid. Meanwhile, unbeknownst to Syndrome, the Incredibles have escaped from captivity and made their way to the site of Omnidroid’s debut. There’s a really beautiful moment between Bob & Helen, where the big guy shows his vulnerable side as he reluctantly reveals that he’s “not strong enough” to face the very idea of losing his family. Unfortunately this nice family discussion is interrupted by the arrival of a giant murder-bot. I hate when that happens. What follows is something superhero fans had been waiting to see actualized on the big screen for decades: a team of superheroes fighting against an honest-to-gosh giant robot attacking the city. In 2004, that was a revelation. Heck, it hasn’t been re-attempted since, though Joss Whedon deserves credit for having a team of superheroes fight off an alien armada that had been attacking the city, even if it’s not fair to the aliens because they didn’t have a Hulk. The Fight: The initial onslaught from Omnidroid scatters the family and leaves the kids too frazzled to react properly. Violet gets her wits about her in time to save herself and Dash from the robot with a shield. She can withstand several blows from the machine’s limbs, but the force of it dropping its entire body on the shield is too much for her, breaking the force field. Mr. Incredible then stops the robot from crushing the both of them by bench-pressing it with all four limbs, which gets him seized and thrown through a nearby office building. He responds by jumping out and knocking Omnidroid down with a flying tackle. He’s helped by the arrival of Frozone, whose ice attacks against the machine’s joints don’t seem to do more than annoy it. When Bob finds and realizes the importance of Syndrome’s remote, the tenor of the scene changes. Omnidroid does everything it can to keep the Incredibles from holding on to and using the remote (before the fight ends, random button-mashing will knock off another whole limb from the robot, and launch it several hundred feet in the air), which necessitates its changing hands a lot. In a clever callback to an earlier scene which combined their respective powers (a superhero twist on the typical “Dad tossing the football” thing), Bob tells his son to “go long” and throws the remote so far only a speedster like Dash could catch it. Helen– seizing a manhole cover and bending her arm around a light pole to create enough momentum to launch it, a rather awesome move– knocks out Omnidroid’s cannon, which is kind of too bad because it was cool as heck to watch Dash dodge all those laser blasts. The robot is still dangerous enough even with its offensive capacity diminished and pursues Dash onto a body of water, but fortunately Frozone is there to skate to Dash’s rescue, creating ice walkways for them to slide around on. There’s another fun bit where Frozone insta-freezes a giant splash from Omnidroid to cushion everyone’s fall. We learn that the machine is still projectile-capable when it launches a claw at Robert to keep him from seizing the remote, though the loss of that claw causes the robot to stumble on one of Lucius’ ice slicks. An invisible Violet finally seizes the remote, and that, combined with Bob’s recollection that the robot’s shell is not strong enough to withstand blows from its own limbs, leads to the family launching the forgotten claw straight at Omnidroid’s metal heart, ripping its power source right out. Thunk. Really great work is done here. The city setting is a change of scenery, since the majority of the film’s action having been on varying parts of Nomanisan. As with the previous dynamite sequence, everybody gets at least a thing or two to contribute, scoring lots of little victories against Omnidroid while never undercutting just how nigh-unstoppable and relentless it is. Giacchino’s jazzy music is as fun as ever. As good as the staging is, I think there might be one or two “last minute saves” too many in this scene– a temptation that’s hard to resist in scenes with multiple protagonists moving in & out of the action. And as noted, the nature of the scene changes greatly when the remote is introduced: away from being a “fight” to more of a chase/defensive/keep-away sequence. After that, aside from Helen’s sweet move taking out the blaster, there’s not much in the way of back & forth with Omnidroid, just a lot of looking for an opportunity to exploit its weak point with one fatal blow. Still, it’s superheroes vs a giant robot attacking the city– how much can you really quibble with that? Recommended Links: It appears that Brad Bird felt a disturbance in the Force, because while I was writing the drafts of these posts he happened to mention that he might get to work on making an Incredibles sequel after all. I rather think we should already have had like one or two of those already, but I won’t complain. 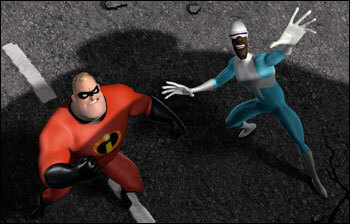 This entry was posted in Incredibles, The and tagged animation, melee, Pixar, superheroes, The Incredibles.